This winter, most of us have spent our time worrying about fitting all our relatives under one roof over the holidays, or fitting into our summer wardrobe after a season of festive food. However, Professor Matthew Alford, a seagoing physical oceanographer at Scripps Institution of Oceanography at UC San Diego, and his research team, are more worried about how deep-sea mining fits into our oceans. Deep-sea mining involves the retrieval of valuable minerals, in the form of nodules, from the seabed surface. This retrieval results in the creation of clouds of materials, or plumes, that go on to interact with the water column. Alford studies this behavior to gain a better understanding of the environmental impacts of deep-sea mining and to develop best practices for future mining. Alford will depart on his twelve-day cruise this Feb. 22 on R/V Sally Ride with colleague Thomas Peacock, professor at MIT, several students, two scientists from the International Seabed Authority, and two environmental scientists from the Global Sea Mineral Resources mining company. “We see this as a community-wide project, from the ground up,” said Alford, alumnus of Scripps Oceanography (PhD '98). Seabed mining results in two kinds of sediment plumes. First, mining in the seabed stirs up sediment. This plume of fine particles eventually spreads from the mined area across the ocean floor, covering a section of the seafloor and impacting numerous seafloor habitats. Secondly, mining involves the collection, and subsequent jettisoning, of unwanted sediment back into the ocean. Mining for manganese nodules, for example, requires these nodules be scooped up from the ocean floor and brought to the water’s surface. In this process, miners inadvertently collect unwanted material along with the manganese nodules. This excess material is then pumped back to the ocean floor in the form of a discharge plume. While this byproduct plume is originally returned at depth, it eventually settles out, due to density matching. This results in both a lateral and horizontal spread of minerals, a phenomenon that has never been observed in the ocean before. Alford and his team are trying to correct this lack of understanding of plume behavior by creating and releasing artificial plumes of both salt and sediment into the ocean. “We need heavy, dense water to create a plume. You can do this with salt, creating hyper saline plumes, and you can do it with sediment,” said Alford. According to Alford, it is important to study the behavior of both hyper saline plumes and sediment plumes because the two interact with surrounding water differently. This is because sediment, unlike salt, doesn’t dissolve in water. After manufacturing these plumes, Alford and his team will release them into the water. “Essentially, there’s a pipe outlet underneath the ship that pumps out sediment, like an upside-down chimney,” said Alford. The team will then image the plumes using a remotely operated vehicle (ROV) and 3D sonar techniques. Specifically, Alford and his team will rely on a phased array Doppler sonar, which measures the velocity of water flows by assessing the changes in the wavelength of the sound that has been reflected off the material within the plume. Alford and his team also used this sonar in a cruise last February. The resulting images will help them understand the behavior of the plume: how the plume descends and where it goes. This research is especially important because, over the years, scientists have focused primarily on the impact of mining on the sea floor, not on the water column. “There are many different kinds of impacts on the bottom of the ocean floor and in the water column; Alford is tackling the most poorly understood part,” said Lisa Levin, a deep-sea ecologist and distinguished professor at Scripps. Alford’s goal in understanding the behaviors of plumes is to establish environmentally responsible practices for deep sea mining, and thus bring more affordable minerals to the planet. As with all oceanographic research, projects like this require access to the sea aboard highly-specialized and capable ships. 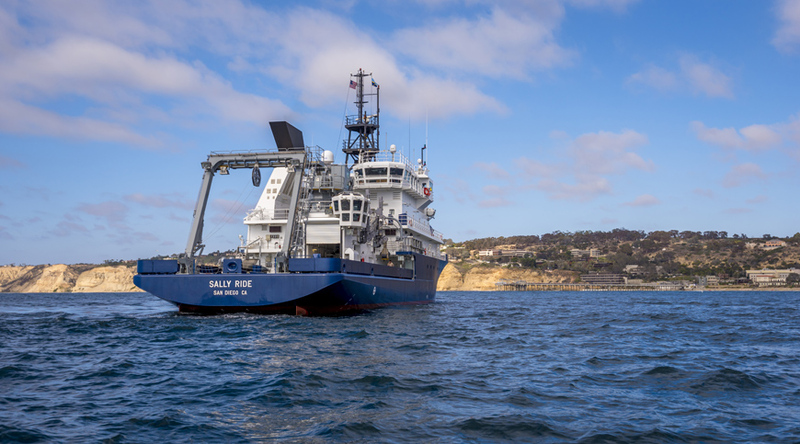 In Alford's case, his ship time aboard R/V Sally Ride is supported by the UC Ship Funds Program, a one-of-a-kind program administered by Scripps to provide faculty and students with critical research opportunities aboard Scripps-operated ships. “The ability to get ship time to do this kind of program is really unique. This program wouldn’t be happening if it weren’t for the UC Ship Funds Program,” said Alford. While the UC Ship Funds Program has been critical in supporting Alford’s own research, he also sees it as incredibly valuable to his students. Alford runs a class at Scripps that teaches students proposal writing and experiment design. In this class, students write their own research proposals and apply for funding through the UC Ship Funds Program. Alford’s experiences with the UC Ship Funds Program as both a recipient of support and a mentor to students receiving that same support demonstrates the unique versatility of the UC Ship Funds Program. In short, the UC Ship Funds Program empowers established faculty, like Alford, to conduct research while simultaneously providing students the ship time and experience they need to develop their abilities as scientific investigators. This two-fold aim of the UC Ship Funds Program ensures that the next generation of scientists will be educated and experienced enough to build on the research conducted by Alford and his colleagues. And, the ship-time provided to Alford by the UC Ship Funds Program is more important now than ever, as Alford says he and research partner Peacock think deep-sea mining will become common practice in next 5 to 10 years. Alford and his team plan to meet this inevitability with a set of best practices for mining informed by both modeling and field research. Understanding plume behavior is important to develop best practices for deep-sea mining and to predict its environmental impacts. It is clear these tailing and discharge plumes will redistribute sediment to foreign locations, undoubtedly affecting ocean habitats and their biodiversity. These impacts on ocean habitats all have very real consequences for Californians, as these changes could impact the state’s fisheries and coastlines. Levin explains, for example, that deep-sea mining could result in the contamination of habitats near the mining site. Once the sediments are in the water column, for example, they can be carried to surrounding areas. Levin also highlights that the sediment plumes might interfere with the way light penetrates the water, which would affect the ability of marine plants and animals to get nutrients. They could also alter bioluminescence and the way marine mammals transmit light. Furthermore, these sediments could clog the feeding apparatuses of plankton. This would have cascading impacts on the rest of the food chain. And, the sediments might impact the way sound travels, which would have serious impacts on the ability of marine mammals to effectively use their sonar to communicate and navigate. It is clear that deep-sea mining has extensive impacts on the ocean’s biodiversity. As such, it is exceedingly important that the mining that goes on is informed by carefully conducted research, like Alford’s, in order to minimize the negative impacts on existing marine habitats. You can follow Alford and his team’s cruise at http://www.mod.ucsd.edu.